How do you build a shou sugi ban fence? Is it a DIY project? No doubt, it is a challenge but with the proper knowledge and tools it can be a DIY project most folks can accomplish. First and foremost, safely is paramount given you are working with fire. You’ll want to have the proper safely equipment close at hand at all times. I kept a fire extinguisher, garden hose, and other safety equipment such as gloves and protective eye wear on hand at all times. First, I found a local handyman on Craig’s list with a small tractor and auger to install the fence posts. Next, I purchased a propane torch. They are inexpensive ($20 – $50); check Harbor Freight and similar stores. The propane torch attaches to a standard 20 lbs. propane tank (typically used with propane grills, etc.). I attempted to use old fence panels reclaimed from a local fence company. They were removing a few thousand feet of fence from an apartment complex. 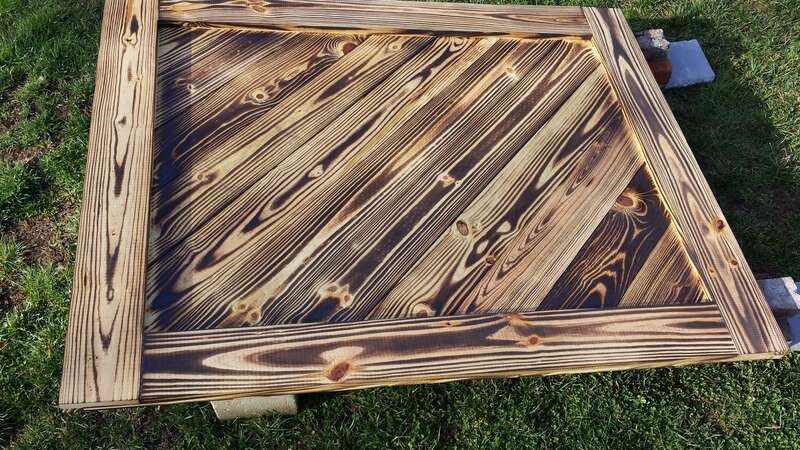 Unfortunately, power washing, dismantling, and preparing the old fence pickets just wasn’t worth it nor did the reclaimed wood look all that great as a fence panel burned using the Shou Sugi Ban method. We’ll use the reclaimed wood for other projects. For the fence panel sections, I used standard dog-eared fence pickets sourced from the local home stores ($1.50 each at Lowes & Home Depot). I didn’t want the “dog-ear” look so I cut them off. Instead of 2″ x 4″ braces, I used standard deck boards ripped in half (bottom of fence panel on each side). Once burned, the deck boards show a lot of wood grain and worked well for this application. 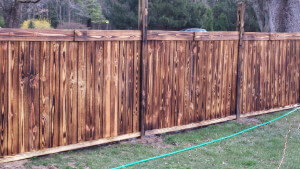 As a general how to guide for building the fence panels, I found a handyman article that was very helpful; see my Pinterest Fence Board link here. This article tells how to build a durable, good-looking fence, from start to finish. Initially, I burned the wood prior to building the fence panels. After a few panels, I found it easier to burn the wood once it was in place. You will burn some grass using this method so keep the hose handy for sure. For the garden gates, I used the more expensive dog-eared fence pickets (about $2.50 each). I built and burned the gates before hanging them in place. The better wood results in a slightly different Shou Sugi Ban look. It makes the garden gate stand out and we like the effect here. Next is landscaping. I recently purchased an Earthwise electric tiller which helps out tremendously when preparing the garden beds in the spring. Well worth it. I’ve owned a gas-powered tiller but it was always a royal pain to start. It died after a few seasons and I won’t go back to the ga s-powered option. The small engines on these things just don’t work consistently or for very long it seams. 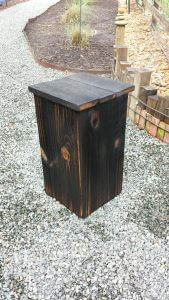 Another Shou Sugi Ban project recently finished is my plant stand for our front porch. This was an easy DIY project that only took a few hours to complete. It is made using two 2 x 4 frames (12″ x 12″), reclaimed fence boards (sides), and reclaimed barn wood top. Yes Joshua, I used pressure treated wood. First I tried using recycled fence panels a local fence company was giving away. They were in the process of replacing a large apartment fence. We power-washed the panels then removed the usable pickets. That didn’t work very well; it took way too long to prep the pickets and the panels I made from the recycled wood came out too dark/grey. I still have that panel made from the recycled fence wood up on the fence and I’ll post a picture for you. It definitely doesn’t look all that great. Next, I purchased 5/8 in. x 5-1/2 in. x 6 ft. Pressure-Treated Pine Dog-Ear Fence Pickets (about $1.25 each) from Home Depot and Lowes. I had a few hundred delivered (initially) but I had to spend way too much time picking through them; returned almost half that were split or just crap. You are better off going to the lumber store and picking your own, which I did subsequently. No sanding. Most of the rough outer layer of the wood burns off quickly during the process. I didn’t want the look of the “dog ear” in my design so I cut it off. The top rail in my design covers the dog ear so you don’t necessarily need to cut them off if you use a similar design. However, the recycled panels we started with didn’t include the dog ears so they were slightly shorter than the standard six feet. Therefore, our new pickets needed to be slightly shorter also to be consistent. For the gates, I used a better quality picket; 1 in. x 6 in. x 6 ft. Pressure-Treated Pine Dog-Ear Fence Picket (about $2.50 each). These are more expensive but much better quality (without knots). Rails: I ripped pressure treated deck boards in half for the rails at the bottom; one piece on each side of the fence. For the top rails (both sides of the fence), I used two pickets spliced together; to strengthen the splice I covered it with a square piece of wood I cut from a picket. Sealing: You don’t want to “seal” the treated lumber right away. It needs to dry out before sealing. I purchased a sealer, which I’ll apply this spring now that the boards are dried out (almost a year). I am going to burn the wood again; slightly in some areas where it didn’t burn much the first round. I didn’t burn extensively the first round given I wanted a lighter look; I didn’t want a black fence look. 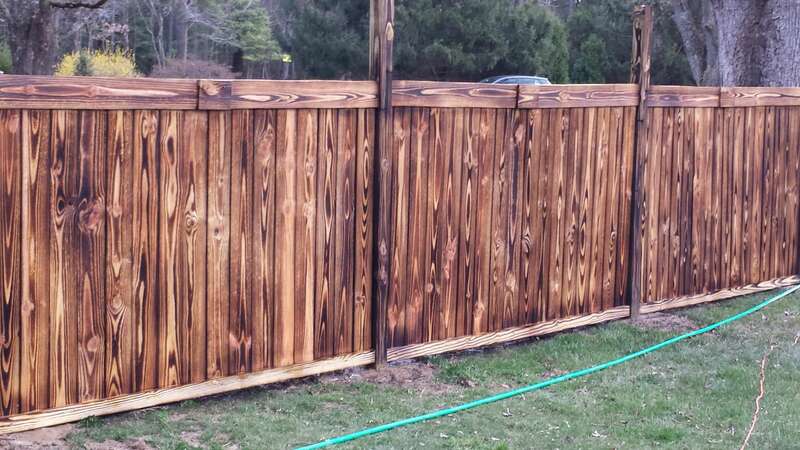 Burning the wood takes very little time if you want a lighter looking fence. Note: some of the black (charcoal) color does weather off the lightly burnt areas. Those are the areas I am going to burn again before sealing. I’ll post a few more pictures shortly. Overall, it appears to be worth the effort. It ended up costing a lot less than the quotes I rec’d for a standard, run of the mill fence from the local fence companies. Also, our neighbors and friends said they love the look of the fence; we rec’d numerous positive comments after building it. I still need to complete the “top” portion. You’ll notice the posts are much taller than the pickets. I am creating a rectangular panel for the top portion to increase the height of the fence. I’m not sure what design I’ll use at this point, but I’ll take suggestions for sure! I’ll post a few more pictures showing you what it looks like after a year of weathering. It hasn’t turned “grey” yet but it likely will if I don’t seal it soon. Check back or feel free to contact me if you need more info (greg “at” oilobit.com). Thanks for stopping by and let me know how it goes. We can post your fence pictures if you send them to me. Again, thanks. Hi Greg. Nice work on the shou sugi ban fence. 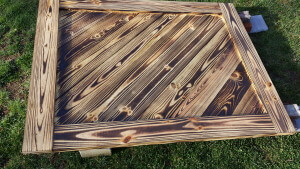 I have a grill table I’m going to build and want to give it a similar shou sugi ban finish. My question is whether you’ve seen any gaps where your boards were joined that formed from the heat applied during the process. My build will require tight-fit joints using pocket hole screws and I’ll be applying glue along each seam as well. I plan to test how this joinery does under the heat, but wanted to hear your experience as well. Also, the intricate nature of this build with a storage compartment and hinged lid don’t make it easy to apply the shou sugi ban before building. Thanks for the post!